Senboku City, Japan – After a rainy day of training on Friday, the Tazawako event crew worked hard to keep the course in tip-top shape, leading to Saturday’s World Cup moguls competition in Japan. Canada’s Mikaël Kingsbury and Australia’s Britteny Cox were victorious once again. 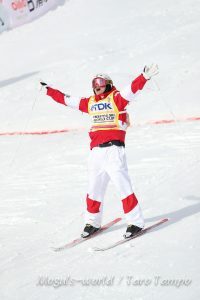 In the men’s competition, Kingsbury came out on top with a score of 89.99, one of the highest earned by any moguls skier in any stage this season. His teammate Philippe Marquis was second and France’s Benjamin Cavet third. With this 39th victory, Kingsbury not only is assured his sixth consecutive Crystal Globe, but he also breaks Eric Laboureix’ record for the most victories overall in freestyle skiing on the FIS World Cup circuit. The skier from Deux-Montagnes, Quebec was happy with his strategy on Saturday, which earned him his sixth victory of the season. Montana’s Brad Wilson, who won the men’s competition in Tazawako last season, skied strong and qualified high throughout the day to advance to the super final and finish fourth, for the best result for U.S. men. Wilson skied some of the fastest times of the day, including the fastest super final time, 22.21 seconds, in his fourth place run. Other U.S. athletes making it into the finals included Troy Murphy (Bethel, Maine) and Patrick Deneen (Cle Ulm, Wash.), who finished seventh and 12th, respectively. On the women’s side, Aussie Britt Cox took home yet another win, with France’s Perinne Laffont landing her second podium finish of the season in second and Canada’s Andi Naude in third, repeating her result last week in South Korea. . Through the qualifications and the first finals round of the ladies competition it looked like Laffont was primed for a repeat performance on the slope where she earned her first World Cup victory last season. However, come time for the big final, Cox had other plans. While Laffont was able to score the highest turning scores of anyone in the big final, Cox’s faster time and better jumping gave her the edge, but only by the slimmest of margins. When it was all said and done, less than half a point separated the two skiers – Cox winning with a score of 78.57 to Laffont’s 78.36. The win was Cox’s sixth of the season, giving her seven podiums in eight events and a 234-point lead over Laffont on the World Cup leaderboard. Also worth noting is that Cox’s podium was the 24th for the Australian team across the Freestyle and Snowboard disciplines, marking a new season best for the nation. After strong results in the qualifying rounds and advancing four skiers to the final, none of the U.S. women were able to break through to the super finals. Keaton McCargo (Telluride, Colo.) was the top finisher in seventh. Olivia Giaccio (Redding, Conn.), Mikaela Matthews (Frisco, Colo.) and Tess Johnson (Vail, Colo.) joined her in the finals, finishing 10th, 11th and 15th respectively.